It's late August, which means pepper season. 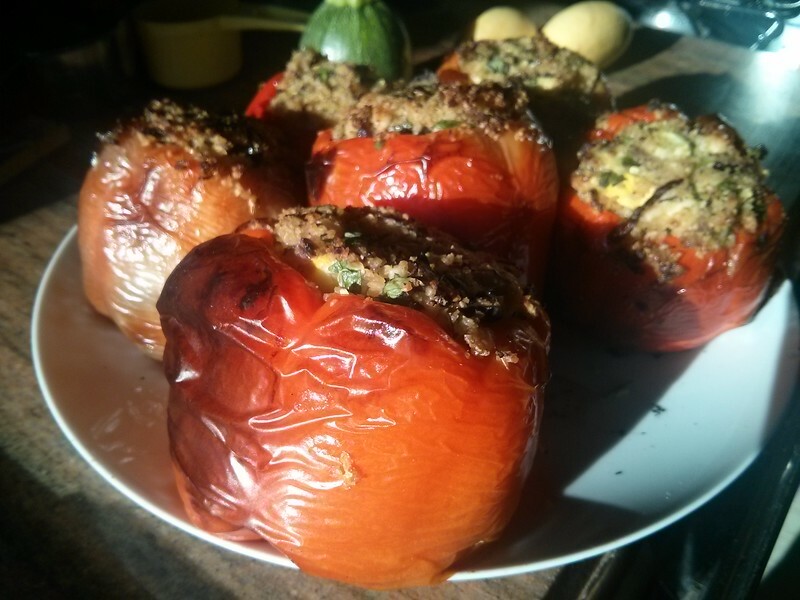 For many folks, it's also Oh-God-don't-you-dare-turn-on-the-oven-in-the-house season, which makes it challenging to prepare stuffed peppers at the height of pepper ripeness, when they are best. Believe it or not, it was that temperature in San Francisco this weekend, so I devised a way to do Greek-style stuffed peppers entirely on the grill. Note that this recipe involves having the grill going for a long time, so make sure you have plenty of fuel. Also think about what else you could grill while you're stuffing the peppers (e.g. corn, tuna, beets, etc.). Also, see the notes at the bottom about the ingredients. While prepping the onions, garlic, and herbs, heat up the grill. Dump the bulgur in a fine sieve, and rinse it in cold water, tossing to wet it all. Leave it suspended in the sink to drain. Put the summer squash on the grill. Make a foil packet and seal the onions and garlic inside, mixed with a little olive oil; put this on the grill as well. Turn the squash every 3-4 minutes, until mostly cooked and starting to blister and burn. Take everything off the grill, and let cool for 10 minutes. If using a gas grill, turn it down to low. Cut the stem out of each pepper, making sure to keep the sides and top "shoulder" intact (this is harder than it sounds). Reach inside with your fingers or a melon baller and remove any remaining seeds and pith. Combine the drained bulgur, herbs, and feta cheese. Add the onions and garlic. Dice the cooked squash small (about 1/4"), and mix that in as well. Add 2 Tbs olive oil, and salt to taste. Stuff the peppers with this mixture, pressing down to pack them full. You may have some stuffing left over; it makes a nice salad if left to sit overnight. Turn the heat on the grill back up. Place the peppers over indirect heat and close the lid for 10 minutes. Check them, and turn any which are blistering on one side. Cook for another 10 minutes or so, checking them as necessary. They are done when the peppers are blistery/burnt all around and the stuffing is crusty on top. Serve hot, and give diners sharp knives to make cutting them easier. Peppers: you want ripe bell peppers for this, such as red, yellow, or purple peppers, not green ones. Select carefully for peppers with four-lobed or five-lobed "square" bottoms so that they will stand upright on the grill. This recipe is for 6 medium-to-large peppers (about 3.5"); if you have very small or very large peppers, adjust the pepper/stuffing ratio. Herbs: mince together any two or more of the following fresh herbs: flat-leaf parsley, oregano, dill, thyme, or mint. If you're short on fresh herbs, mince 1/2 cup parsley and add 1 tsp each dried mint and dill.